How To Train Your Dragon 2 is a Terribly Long Name For Such A Good Movie. Animators have it rough. The amount of detail that goes into every frame of a modern animated film is astonishing, absolutely amazing. Often times that detail only exists for seconds, if that. With the misconception that animated films with low MPAA ratings are mostly for children, that level of detail can be lost. I’ll be the first to admit, I often times overlook animated films when deciding what to pay money to see in theaters. While on vacation, I went to a local discount theater and caught a showing of how To Train Your Dragon 2 and coincidentally watched one of my favorite movies of the year. I need to rewatch How To Train your Dragon because when I rented it I wasn’t blown away. I know this franchise is loved by many, and it’s even revered above certain Pixar offerings. It was fun, but something that I was ok just watching once and calling it good. Not so with the sequel. How To Train Your Dragon 2 shows the inhabitants of Berk in a whole new light. Their entire society now revolves around dragons rather than fears them. Hiccup is reluctantly being primed to take over responsibility as the new chieftain, when he discovers a group of dragon catchers that are supplying a mad man with forces for his army of dragons that will be used as weapons to conquer the world. You can guess what the remainder of the film is about from there. First off, the movie looks incredible. I don’t think I’ve had a movie appeal to my primal sense of adventure this way in years. The scenes of Toothless and hiccup flying over pristine landscapes, crystal oceans and through open sky were all it took to get me caught up in the movie. Add to that a heavy dose of accurate emotional weight and a hefty dose of dragons and you’ve got HTTYD2. Everything about the movie looked like familiar in the sense that we’ve been seeing dragons on film for decades, but it built on the uniqueness of the first film in just how different someone could interpret the beasts. It was fun just seeing how many variations of the fire breathing reptiles the animators could present. The environment only added to the aesthetic appeal and sense of adventure. Berk is a fairly wild city, but it pales in comparison to the harshness beyond it’s borders. While a movie can be pretty to look at, if it falls flat it the story telling or in the character department then you’ve got a major problem. Fortunately this was not the case. Dreamworks hit a homerun with how they advanced their characters. We’re not dealing with the same set of problems or issues already dealt with in the first film, we’re dealing with new challenges, harder ones that carry more consequences and change the franchise in bolder ways than I anticipated. It was more than I had anticipated, and I found myself far more emotionally involved with the humans and dragons alike. 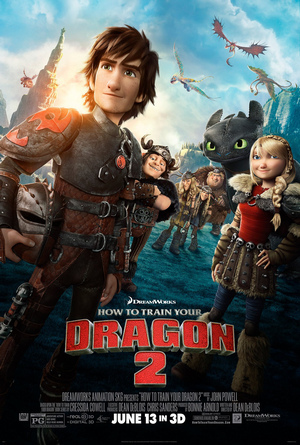 How To Train Your Dragon 2 manages to take the audience on a ride to another world filled with adventure, danger and unexpected beauty. The characters are flawed and believable, it packs an emotional wallop while still being appropriate and entertaining for a young audience. Despite the many offerings this year, I would rank this among the top in terms of just sheer fun adventure. Also, Toothless is still adorable. The wildly popular Transformers movie franchise is often trounced by critics for a number of reasons. Most commonly I hear about how the movies took a beloved childhood series and strayed from the spirit of the source material. I could not relate. I played with Transformer toys growing up, sure, but I didn’t adamantly watch the series, and I couldn’t have given you any of their names. To me, the movies were nothing more than poorly constructed money farms. Then they announced that Michael Bay was producing a Teenage Mutant Ninja Turtle reboot. But with Bay Just producing, maybe the director had a chance? Jonathan Liebesman. He’s directed a few action films, none of which were of great note. “Still, it’s Turtles” I thought “It can’t be that hard to get right, I mean none of the previous movies were works of art. I’ll just wait to see who they cast”. The realization that Casey Jones wasn’t going to be in the movie was almost as heart wrenching as the fact that Megan Fox was cast as April O’neil. Sorry, I’m letting my nostalgia seep into this review. It’s just that for the first time, I think I know what those true Transformers fans must have felt like. 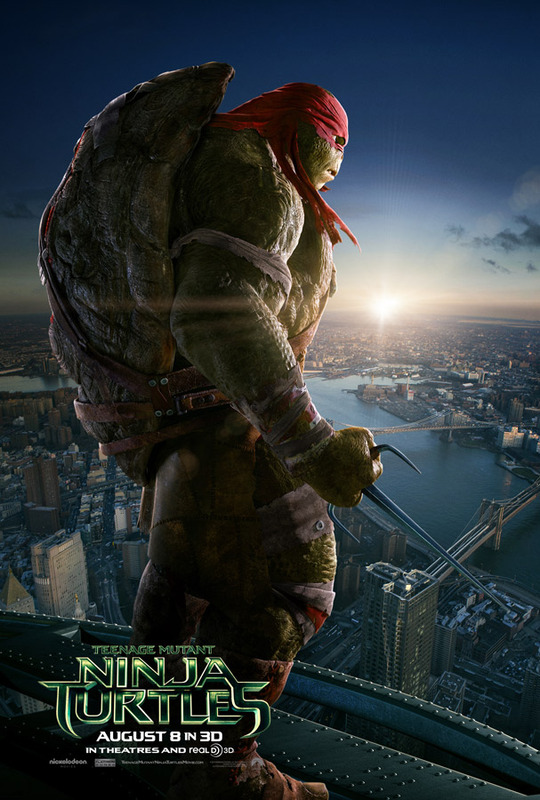 Teenage Mutant Ninja Turtles is the fifth big screen title for the heroes in a half-shell, and is a complete reboot. The real focal point of the film is April O’neil, who is a doggedly determined reporter that wants to break away from the puff pieces she’s always assigned. This leads her to investigate a local crime organization known as “The Foot”. She learns that someone is thwarting some of The Foot’s operations. She eventually finds herself in a trap set by The Foot to lure out these vigilantes. They are, of course, the titular turtles. As April gets closer to the four reptile brothers, she learns how they came to be, and begins to comprehend just what the villains have in store for the city of New York. Along they way she meets the Turtles Master; a rat named Splinter and their nemesis; The Shredder. The premise is pretty standard Turtles stuff. It’s a franchise about four anthropomorphic turtles named after renaissance artists who have mastered ninjutsu and fight organized crime in the city. Teenage Mutant Ninja Turtles is a franchise that survives on a mixture of weirdness and charm. This film lacked the charm and amped up the weirdness in all the wrong ways. Megan Fox sucked every quirk out of the character of April o’neil. No longer the smart and tough reporter, she reduced April to a pretty face to look at that served only to spout exposition to the audience. The turtles were…. uncanny. Their faces were unsettling to look at and I simply couldn’t get a tangible grasp on their being and where they belonged in the world of the film. The most frustrating thing was that it felt like the entire cast was on the verge of rolling their eyes because they thought the concept of a Turtle movie was above them. The movie would literally make fun of the weirdness and charm that made this series, and then make half an effort to duplicate it. I once went up with a group of people to sing Bohemian Rhapsody at a karaoke place. I was embarrassed, so rather than get super into it like the others, I attempted to save face and just sort of stood up there awkwardly and quietly sang along while the others were practically rolling on the ground. If the other movies were like the people singing and rolling on the ground, this one was me. None of us could particularly sing very well, but all the others were far more entertaining to watch. This movie is worse than Turtles in Time a film that is almost universally recognized as the worst in the franchise. A big problem with this film was just how poorly it was written. The villains have no real goals other than some conceited plan to make lots of money, despite already being ridiculously rich. It felt like, with the exception of the turtles themselves, everyone was simply reading a rough draft of the script word for word. Most of the lines were there to blatantly state the obvious to no one except the audience. They spent far too much time explaining the nonsensical plot, and ultimately failed at that. There were one or two jokes that landed, but the majority of the humor was squelched by a lack of enthusiasm and heart. In it’s attempt to be a gritty reboot, Teenage Mutant Ninja Turtles managed to be the one thing I didn’t expect it to be; boring. If you’re interested in my reviews of the other Turtles movies check them out here. Their presence in fiction mirrors the reality in which we reside; a reality that reflects the fact that zombies are everywhere. In fiction they’re a world wide threat bent on nothing in particular except eating people. In reality we just have an over saturated amount of TV shows, books, comic books and concept art that caters our cultures insatiable and weird appetite for these cannibalistic corpses. I’m part of the problem too, I love a good zombie movie and can appreciate the moral and logistical quandaries that they present to those attempting to survive in their world. World War Z is the best zombie story I have ever consumed. Let me be clear, I am currently talking about the novel by Max Brooks in which an unnamed (and certainly not Brad Pitt) UN worker travels around the world AFTER the big Zombie war interviewing survivors. Like anything that becomes remotely popular it demanded a cinematic representation! And so we got a film with the same title….and that’s about it. World War Z (film) stars Brad Pitt as a UN worker by the name of Gerry Lane whose task it is to finds himself thrust into the center of a massive scale zombie epidemic. He is tasked with finding the origin of the disease with the hope of figuring out just what can be done to stop the spread of the infection. This takes him all around the world, where he observes a few different temporary solutions that various cultures have enacted to help protect themselves…all of which end up failing. It’s a sort of follow-the-bread-crumbs adventure in which Brad Pitt straps magazines to his forearms as a type of makeshift armor to prevent being bit. Honestly that was my favorite part. 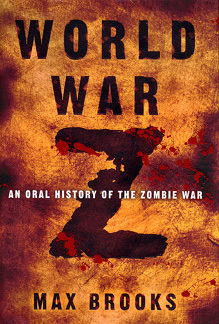 World War Z (novel) is narrated by an unnamed UN worker that is tasked with traveling around the world to interview survivors of the zombie war. The novel starts out with the war being over. Humanity won the fight against the zombie threat, but just barely. Each chapter is an oral report of how a different culture or people group witnessed and consequently survived their particular encounter. The accounts range from a colony yuppie campers attempting to flee north in their caravan of luxury motorhomes to a Japanese teenage gamer who must figure out a way to escape from his skyscraper home. Major battles are discussed in great detail and the entire course of the fight is laid out in different styles and flavors for the reader to savor. Brad Pitt’s starring vehicle hovered around the 200 million dollar mark to make. It was ok. It was an honest to goodness zombie fest in which millions of zombies ran very quickly towards the protagonist at almost every turn. The film managed to gloss over the intricate details laid out in the novel and replace them with faster enemies and bigger explosions. It was a visual effects feast that practically begged you to just switch off the part of your mind that yearns for a plot within a story. Sure there was a goal Gerry was trying to attain, and it had to be done quickly, but it is nestled safely under an enumerable amount of human corpses. It had it’s merits, and while the large scale attacks were impressive to look at, they had little effect on my emotional reaction to the film. It was the tight, claustrophobic scenes that amped up the suspense. The Novel offered a large series of individual stories that, when combined painted a picture of the full scale that the fictional zombie plague had on a vast number of cultures and individuals. Each account has it’s own protagonist and their own setting. Some read like a pulp adventure novel while others are absolutely chilling in their dissection of human nature. While the zombie threat is ever present and the main focus of the novel, it isn’t the sole enemy. Some accounts take into account the psychological damage associated with seeing your loved ones turned into monsters, it looks at the depravity of humanity, at times allowing for very little room to distinguish between the real horrors of humanity and the fictional horror of the zombies. Unlike the film, the book uses the traditional “slow zombies” and manages to make them terrifying. The narrator of the book takes a back seat to the survivors, the everyday people that did what it took to survive. 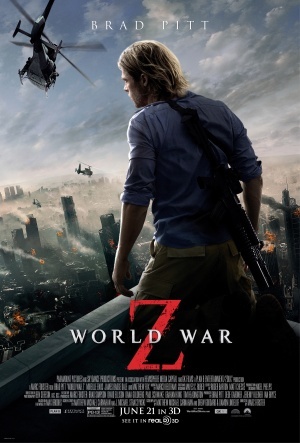 The World War Z novel was so good it ought to have it’s own movie. As it stands it does not have that. Aside from a few, almost coincidental similarities, the novel and film that share a name are worlds apart (within the scope of the zombie genre). Where the film was your run-of-the-mill action film with a massive budget, the novel presents you with a great number of individual stories, each interesting and unique, but working together to form the most compelling Zombie story I’ve ever experienced. Adaptations are a funny business. Taking an original artifact, something that’s well loved and already has a fan base and then tweaking it in a way that makes it appeal to a broader audience. Too often the resulting re-translation will alienate those that love the original most. The is an almost indistinguishable line for those running the film industry, a line between a great adaptation and a cold dead husk of a what used to be beloved idea. Adaptations from animation to live action can be particularly difficult and are just terrible when done poorly; as was the case with The Last Air Bender. The difficulty is that you’re changing from a medium that doesn’t have to share the same physics or even social norms as real life and your trying to interpret it in a much harder lined reality. The beauty of Speed Racer is that it doesn’t try to be a live action movie, it’s true to the source, and, consequently, stars a cast made up of flesh and blood. I had the pleasure of re-watching this movie again, after reading Ryan Partlow’s review. 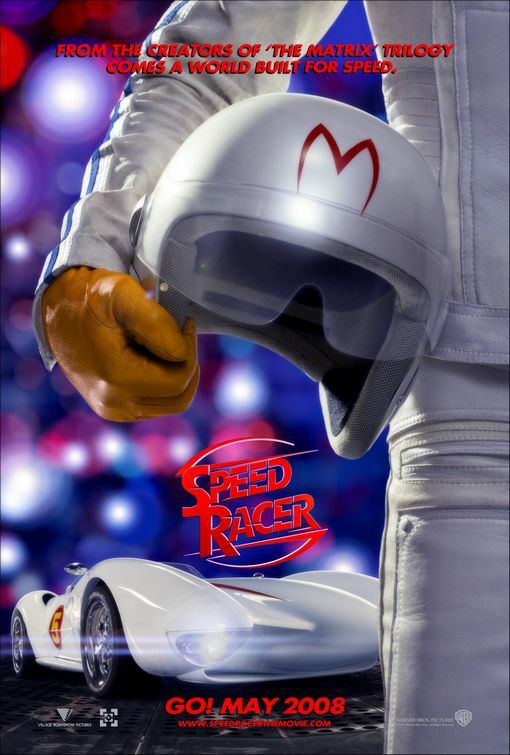 Speed Racer takes it’s story and characters from the 1960s anime of the same name. The story centers around the Racer family and their insatiable thirst for racing automobiles. Now, this is far closer to MarioKart than NASCAR, as far as automobile racing goes. When the Racer’s son, Speed, is given a chance to race under the banner of the mega corporation Royalton Industries he must decide weather to continue racing solely for his father’s small auto shop, or take it to the next level. When he learns the dirty secret of the racing industry, Speed is thrown into a highly stylized duel to the death on a number of eye popping racetracks. There aren’t many movies out there that stick so close to their animated source materiel. The cartoon that this is based on had lots of races, lots of action and some goofy characters. This film has all of those, and rather than try to take a simple concept and “drama it up” for a live action release, it gives us what we least expect: a live action cartoon. The story is interesting, and it serves it’s purpose of propelling the hero into life threatening, breath taking races. Everything about this movie oozes classic anime tropes, from the dramatic hand motions to the bright colors of the surroundings. This movie is nothing if it isn’t vibrant. After watching this movie I felt like my eyes were restricting me from absorbing the colors that were bursting out of my TV. I had to mentally change the lense that I was watching the movie with. Looking at it as a cartoon made it far more enjoyable than trying to rationalize it as a live action movie. While the film looked and sounded fantastic (something the Wachowskis are very good at) the editing of the film managed to keep the pace of the movie soaring, even with a longer than expected run time. The climax of the movie in particular was absolutely thrilling. It simultaneously pulled the the emotional strings of the story, and showed the end of the biggest race in the movie in such a flawless way that it was easily the best scene in the movie. With a superb cast that managed to pull off a cartoon persona, good direction and of course the brightest visuals legally allowed on a screen (that last one is probably not true), the Wachowskis manage to give their full effort to something that a small group held dear, in an effort to introduce it to a larger group. And man, what a ride. We are in a constant state of ever expanding cinematic universes. Successful standalone films are few and far between these days, once something is found to be profitable, it only makes sense to milk that cash cow dry, critics and fans be hanged! If it makes money, you continue to grow the franchise, it’s the way Hollywood has been working. So, it came as no real surprise that in 2011 we were “treated” to a prequel to a very successful (and my personal favorite) sci-fi horror film from the 80’s. 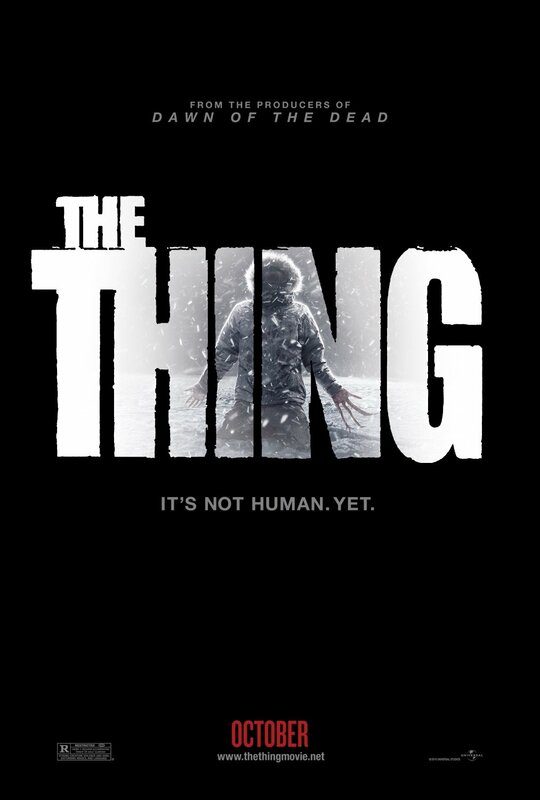 The Thing replicated the same title as the 1980s iteration; an oddly appropriate move given the nature of the monster in the series. The Thing (2011) is the third installment in this quasi-franchise. It started with The Thing From Another World in 1951, was remade in 31 years later with The Thing (1982) and a prequel to that film leaves us with what is now somewhat of a period piece of a 1980s scientific expedition gone awry. Maybe in 30 more years we’ll get a proper sequel, but I hope not. The Thing doesn’t pluck it’s story from thin air, but actually has a very appropriate starting point. In the 1982 version, the scientists stumble upon a destroyed Norwegian camp and one huge spaceship encased in the antarctic ice. The Thing (2011) tells the story of just what happened at that Norwegian camp. While we know the events are probably very similar to the horrors that unfolded in the original film, we didn’t know the exact details until this film came out. Kate Lloyd (Mary Elizabeth Winstead) is hired to aid the in the retrieval of an alien spaceship and life form that has been frozen for many millennia. To their horror, the life form is not only alive, but wanting to feed. In standard Thing fashion, it proceeds to eat and replicate the motley crew of scientists in the most horrific and gross ways possible. Paranoia and terror run rampant as the isolated group must attempt to sift the “thing” from the humans before it reaches the general population of the world. While the plot is virtually indistinguishable from John Carpenter’s classic, they manage to throw in a few original ideas that work really well, and of course there are plenty of jump scenes. I especially liked the way they were able to distinguish the humans from the monster in this film. Without giving it away, it was completely different from the last film, but made complete sense in the scope of the universe. The acting was actually pretty top notch, Joel Edgerton in particular did a pretty great job as the American helicopter pilot, channeling Kurt Russell quite well while still managing to be his own character. It was spooky, it was fun but it wasn’t great. While The Thing (1982) was one of the scariest movies I’ve ever seen, this iteration lacked the claustrophobia and grit that it took to really leave the audience unsettled. The CGI, in particular couldn’t compare to the practical effects used in the 80s in it’s ability to make me queasy. The atmosphere managed to be more comforting as well. The original film used the environment, the dark and the cramped base to make you feel utterly unsafe the whole movie. The base in this film seemed much larger, the weather tamer and the thing itself was far more tangible than it was when it attacked the American base. Instead of revealing it’s monster form only while transforming or going in for the kill, the monster would hunt in the form of a mass of flesh and bones, crawling around on all fours while it actively searched for other people to kill. What made John Carpenter’s Thing so frightening was how it would try to get away unless it was threatened. It would do anything to get away from prying eyes and transform into human form, then try to trick the others. This was a fun prequel that took new approaches to the similar storyline presented 30 years prior. With a fresh new cast and take on the cinematic legend, The Thing (2011) managed to give some mild scares and some genuinely suspenseful moments. Where it falls short is in it’s presentation of the monster itself. What was an intangible horror is reduced to something that looks like it hopped out of the latest Men in Black movie; also the fact that it’s atmosphere was not the proper material you need to conduct the type of horror that made The Thing as truly horrific as it was. John Carter? Never heard of him. When visualizing the sci-fi film genre, I picture it as a large grumble of pugs (a grumble is in fact the correct term for a group of pugs) vying for the undying attention of the general public. They’ll do anything to please the masses, if only they’d be taken to a good home. Science Fiction, when done correctly, can be a massive money maker for movie studios. But they’re fighting against all the other cute little pugs attempting to grab your attention. So, in the scuffle of being cute, a lot of people overlook some rather pleasant and well behaved pugs for ones that, although initially cute, turn out to be impossible to train not to poop on your favorite chair once you bring them home. Now that I have that terrible analogy out of the way, I’d like to introduce you to an overlooked pug, as it were. 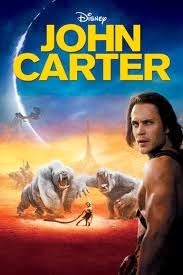 John Carter was a flop. Disney blamed Carter for the majority of it’s $84 million loss in it’s quarter ending in March of 2012. The movie had everything going for it, a good cast and a proven director, yet it was raked across the coals by critics and proved to have one of the worst marketing plans in recent memory. For this reason, I completely ignored it and focused on most of the other Sci-Fi films that year, of which there were many. On a whim I checked John Carter out from the library. The only way I ended up spending money on this movie is by accruing a late fee because I lacked the motivation to watch it in a timely fashion. Imagine my surprise when I sat down and observed a well rounded, beautifully filmed action adventure piece that took place on mars. The visuals alone prove an exciting experience, introducing alien landscapes in ways that, although familiar, are fresh in their potential for hazard and peril. The creature creation with some of the alien life forms was a lot of fun, and having Carter himself be a Civil War era soldier thrown into the futuristic Martian war zone was fun. Taylor Kitsch does a decent job as the titular hero. While I was kind of leery of his portrayal of the character on Earth, once he hit martian shores and we began our fish-out-of-water story, he carried my attention and my allegiance the entire film. While it’s more or less a standard adventure story, John Carter manages to be engaging and far more entertaining than I had anticipated. Carter embarks on the, all too familiar, reluctant heroes journey. Though we’ve seen it before, he does it well. Andrew Stanton shows his directorial chops once again by creating a convincing atmosphere despite the alien nature of the world. It’s a shame John Carter did so poorly. I had almost no intention of ever seeing what was a solidly produced and very entertaining movie. It was just another example of an adorably well behaved pug being outshined by a misbehaving chair pooping one. Just like a good sports movie, everyone loves to root for the underdog. In the same way, I am always on the lookout for independent films that have the power to transcend their own subcategory and get a deserved spot in the limelight alongside blockbuster counterparts. Thanks to Netflix and other streaming services it has become far easier to access numerous films that would have been otherwise unavailable to me. Often times, the lack of budget is glaringly apparent. The lack of funds seeps through the cracks of the project, manifesting itself in one of a thousand different outlets. But that’s the name of the game. As much as I would love to sit down, watch a low budget independent film and have it absolutely blow me away (not a far fetched hope) often times you have to take the good with the bad. With no studio influence, independent filmmakers are free to explore their voice and their craft as they see fit. Boy Wonder is just such a film. 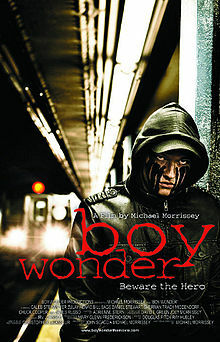 Michael Morrissey presents a Batman-esque tale of a boy that takes a horrific event from his past and uses his anger as fuel to bring a brutal type of vigilante justice to his neighborhood. As a young boy, Sean Donovan sat in the back seat of his mothers car and watched as she was killed by a carjacker. Now in High School, Sean aces his tests, avoids most social interactions and spends most of his spare time at the local police station. As a new detective begins her job at the same station, she becomes interested in Sean’s story and the case surrounding his mother’s murder. As the film progresses we learn more and more about Sean’s past and the relationship he has with his father. Intermingled with the dramatic elements are scenes of brutal street justice in which he observes people hurting others and stopping it at all costs. The movie has flaws, to put it lightly. Some of the acting is stale, the dialogue is far more expository than is necessary. At times it seems like we’re being forced to relate to some of the minor characters when it is neither necessary nor wanted. That being said, Caleb Steinmeyer portrays a truly interesting character in Sean Donovan. It’s an extremely similar backstory with the Batman mythos, but with a financially poor protagonist that has less control and discipline. The story is dark and brutal, almost to a fault, but it presents an interesting set of circumstances with a surprisingly strong leading man. The film itself is shot beautifully, often times giving off the sense that it was much more than an independent, low budget film. I watched some movies last year. This is them.